How and when do you feel empowered? Why and when do you feel disempowered and/or burned out? Who and what do you turn to when you want to reSource? 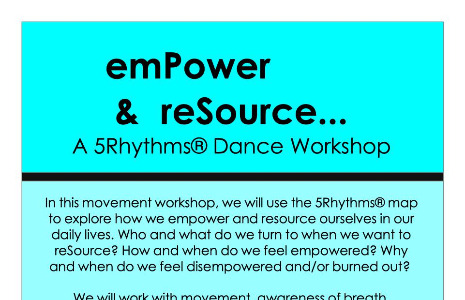 In this workshop, we will use the 5Rhythms® map of Flowing, Staccato, Chaos, Lyrical and Stillness to explore how we can empower and resource ourselves in our daily lives. We will be working with movement, awareness of breath, meditation, and exercises, to move with and through these questions. No experience needed.